Brabant Pierre, 2010. A land degradation assessment and mapping method. A standard guideline proposal. Les dossiers thématiques du CSFD. N°8. November 2010. CSFD/Agropolis International, Montpellier, France. 52 pp. Les dossiers thématiques du CSFD Issue 8 Managing Editor Richard Escadafal President of CSFD Research Director of the Institut de recherche pour le développement (IRD) posted at the Center for the Study of the Biosphere from Space (CESBIO, Toulouse, France) Author Pierre Brabant Honorary Research Director, IRD ( France) Pierrebrabant70 @yahoo.fr Contributors Marc Bied-Charreton Emeritus Professor at the University of Versailles Saint Quentin-en-Yvelines (UVSQ ) Marie-Odile Schnepf Computer-assisted Publishing Operator, IRD Scientific editing and iconography Isabelle Amsallem Agropolis Productions info @agropolis-productions.fr Design and production Olivier Piau Agropolis Productions info @agropolis-productions.fr Translation David Manley Photography credits Marie-Noëlle Favier, Director of the Information and Communications Assistant ( DIC, IRD), Isabelle Lefrançois, Assistant ( DIC, IRD), Christelle Mary (INDIGO Image Library, IRD), Marcia de Andrade Mathieu , Head of the Cartography Service ( DIC, IRD), Annick Aing, Photographer, Cartography Service ( DIC, IRD) as well as the authors of the pictures shown in this report. Editing, production and distribution of Les dossiers thématiques du CSFD are fully supported by this Committee through the backing of relevant French Ministries. Les dossiers thématiques du CSFD may be freely downloaded from the Committee website: www.csf-desertification.org Printed with solvent-free inks on certified chlorine-free bleached paper derived from sustainably managed forests. Printed by Les Petites Affiches ( Montpellier, France) Copyright registration on publication ISSN : 1772-6964  1500 copies © CSFD / Agropolis International, November 2010 For reference : Brabant P., 2010. A land degradation assessment and mapping method. A standard guideline proposal. Les dossiers thématiques du CSFD. N°8. November 2010. CSFD/Agropolis International, Montpellier, France. 52 pp. Également disponible en version française originale Brabant P., 2010. Une méthode d’évaluation et de cartographie de la dégradation des terres. Proposition de directives normalisées. Les dossiers thématiques du CSFD. N°8. Août 2010. CSFD/Agropolis International, Montpellier, France. 52 pp. M a process induced by human activ ities. Our planet and natural ecosystems have never been so degraded by our presence. Long considered as a local problem, desertification is now a global issue that affects us a ll, including scientists, decision-ma kers, citizens from both the South and North. Within this setting, it is urgent to boost t he awareness of civ il societ y to conv ince it to get involved. People must first be given the elements necessar y to better understand the desertification phenomenon and the concerns. Ever yone should have access to relevant scientif ic knowledge in a readily understandable language and format. 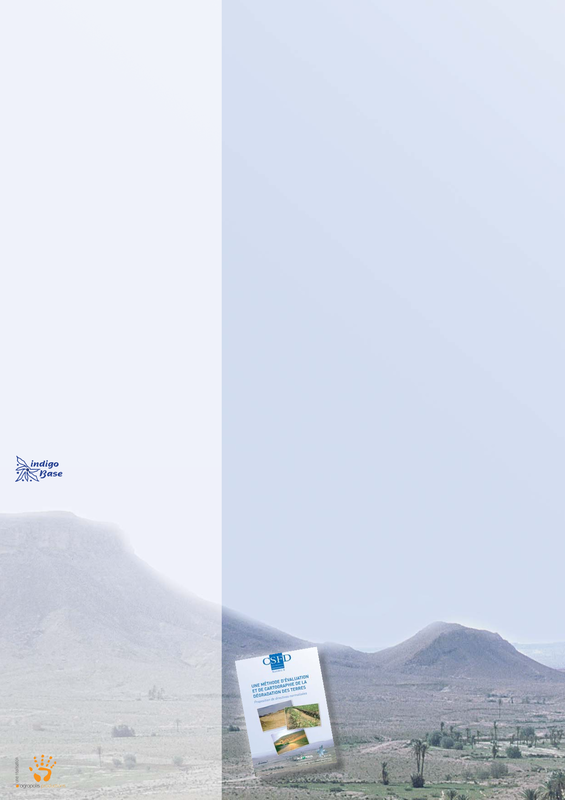 Within this scope, the French Scientific Committee on Desertification has decided to launch a new series entitled Les dossiers thématiques du CSFD , which is designed to provide sound scientific information on desertification, its implications and stakes. This series is intended for policy makers and advisers from the North and South, in addition to the general public and scientif ic journa lists involved in development and the environment. It also aims at providing teachers, t ra iners a nd t ra inees w it h addit iona l information on various associated disciplinar y f ields. Last ly, it endeavours to help disseminate k nowledge on t he combat aga inst deser t if icat ion, la nd deg radat ion, and poverty to stakeholders such as representatives of professional, nongovernmental, and international solidarity organisations. * Cycles biogéochimiques et écosystèmes continentau x. RST N°27.2007-Démographie, climat et a limentation mondia le -2010 (in press) – Gestion des sols et ser v ices écosystémiques (in preparation) – Published science and technolog y reports (EDP Sciences – Paris). ** Terms def ined in t he Glossa r y (page 48) are highlighted in blue and underlined in the text. L extent—especially in developing countries—due to the ever increasing population pressure (forecasts indicate that there will be 9 billion inhabitants in 2050). It is therefore not surprising that this issue is the focus of substantial scientific research. Hence, the French Academy of Sciences, in collaboration with the French Academy of Moral and Political Sciences and the French Society of Agriculture, has in recent years been involved in publishing science and technology reports on the functioning of the human-altered biosphere * . Such degradation is inherent to the location of land on the Earth’s surface (soil is actually the Earth’s living skin), so it is in direct contact with natural atmospheric elements, and with various actions related to the most common human interventions (agriculture, livestock production, pastoral farming and road, airport and housing development, etc.). These latter interventions have long facilitated human life on Earth, but they can also be responsible for soil loss (erosion) or degradation due to an underlying modification of the physical, chemical and biological properties of the soil. Otherwise, the soil may simply be immobilized (buildings). The degradation potential is also clearly related to the nature of the soil. 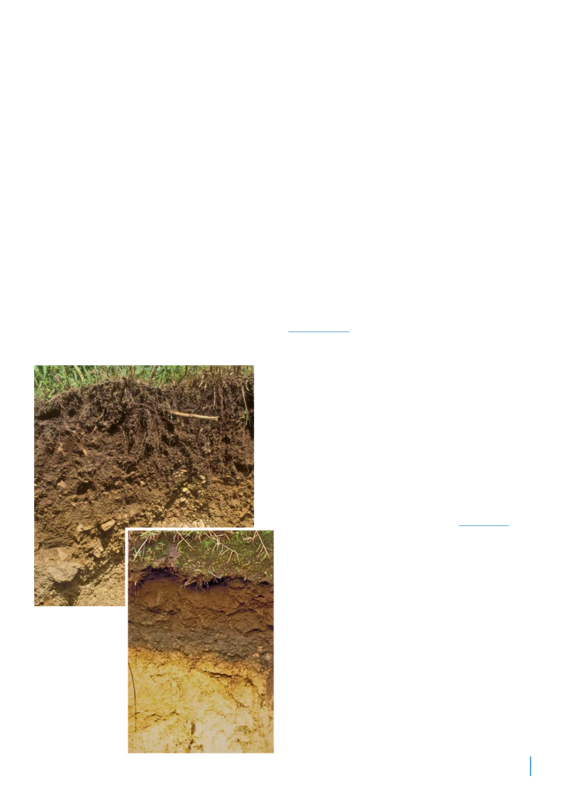 Soil is above all known to be an unconsolidated material made up of three types of overlapping constituents: the skeleton (minerals, plant debris), plasma (clay-humus) and living organisms (roots and soil mesofauna)—interactions between these elements maintain the soil’s coherence and give it a certain degree of stability. This is, however, not always the case when there is an absence of plasma ** , organic material or mesofauna (e.g. coarse mineral and desert soils), or—often in relation with the onset of and increasingly longer and more severe dry season—because of the lack of interactions, leading to plasma-skeleton dissociation, which ultimately causes marked soil textural differentiation (e.g. transformed tropical ferruginous soils in the Sudanian zone). 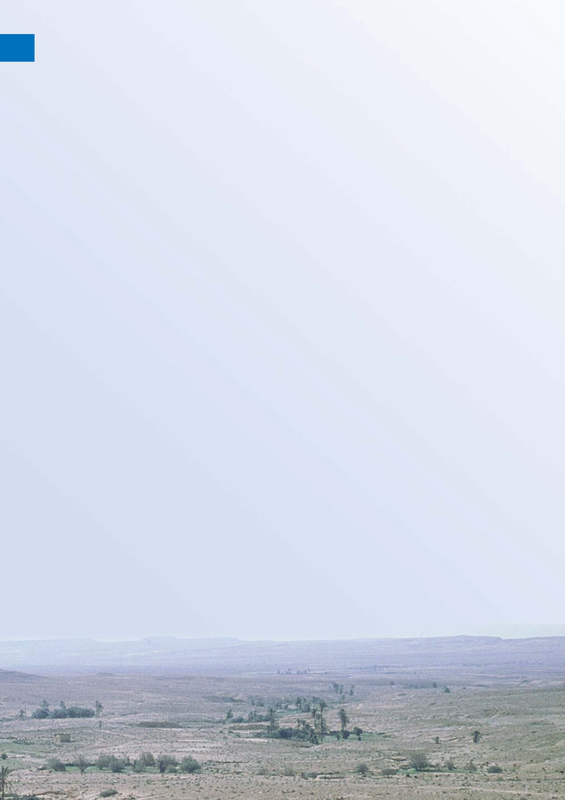 LAND—A PRECIOUS FINITE RESOURCE Edouard Saouma, former Director General of the Food and Agriculture Organization of the United Nations (FAO), stated in 1996: “ Land is the World’s most precious resource. It is not, however, appreciated for its true value. Because of the high prices obtained for gold, petroleum, mineral ore and precious stones, land is treated as mere dirt. ” Land is an essential resource for humans because it generates enough food to feed 6.8 billion inhabitants on Earth. However, it is also a scarce resource, with 30 million km² of arable land currently available, which is only 5.8% of the Earth’s surface! Land resources are being constantly depleted because of high population growth and the negative effects of human activities (overexploitation of land, pollution, etc.) —2 ha of land were available per inhabitant in the World in 1900 as compared to less than 0.5 ha in 2010… L a nd is a non renewable resou rce on t he hu ma n timescale. A hundred thousand years are necessary for just a single metre thick layer of arable land to form from rock in temperate countries, whereas this land can be eroded dow n to t he bedrock w it hin just 25 years (i.e. one human generation) in case of substantial erosion. Land is not a commodit y like petroleum, water or minera l ore. It is a liv ing resource t hat ca nnot be transported from one place to another (one 2 m thick hectare of land weighs 30000 t!). It therefore has to be exploited right where it is, and under the prevailing climatic conditions. ARABLE LAND—PRESERVATION IS VITAL Ocea n s a nd g lac ier s, somet i mes hundreds of metres thick, account fo three-quarters of the Earth’s surfa (510 million k m²). Emerged la nd covered by permanent glaciers span area of 134 million k m² or only 2 , the Earth’s surface, i.e. 245 times t of France. Much of this emerged la exploitable or productive for vario Some emerged a reas a re hot or c covering a total area of 18 million 7.7 million km² just for the Sahara. Ot high mountain regions under harsh cl mat c con t ons with steep slopes. Moreover, freshwater lakes occupy 1% of the total emerged land area. 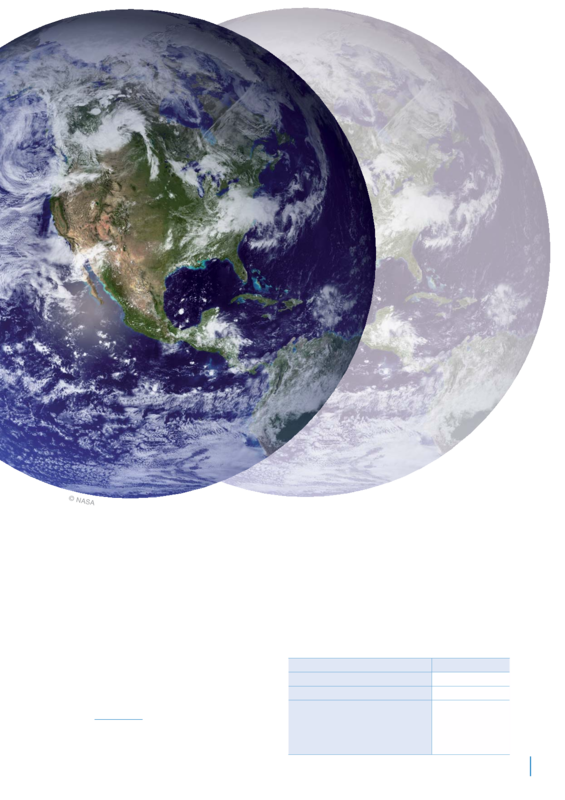 This means that there is only 120 million km² of exploitable land, which is less than a quarter of the Earth’s surface (Pédro, 1985). A third of this exploitable land (45 million km²) is not arable. In some cases, the climate is too dry, such as in part of the Sahel, and there is not sufficient rainfall for crops to complete their growth cycle. Some of this land can still be used for extensive grazing. In other cases, the climate is too cold and the ground is frozen throughout much of the year, e.g. in the northernmost parts of North America and Siberia, where the natural forests are sometimes logged. In some areas, the soil layer is too thin, humid or infertile to be cultivated. The total arable land area is thus not more than 33 million k m², from which 3 million k m² have to be subtracted because the land is extremely degraded and unsuitable for cultivation (ISRIC-UNEP, 1991). Highly fertile arable land—such as that found in the Mekong River delta or the volcanic soils on the island of Java—only accounts for 1.6% of the total emerged land area. Note these figures: humanity currently has access to around 30 million km² of arable land to feed everyone under the economic conditions prevailing at the outset of the 21st century. This represents around a quarter (23.5%) of all exploitable emerged land, which is the equivalent of only 55 times the area of metropolitan France. According to FAO (2000), 45% of a ll arable land on Earth is being utilized. The remainder is lying fallow or under natural vegetation cover, mainly in Equatorial regions, including the Congo and Amazon forest zones. Arable land is thus a not very widespread natural resource that is nonrenewable on the human timesca le. It is vital for humanity to preser ve this resource. > FOCUS | Land and soil— two overlapping concepts The ‘land’ concept is broader than the ‘soil’ concept, with soil being the main constituent in the land concept: Land is the “ part of the Earth’s surface that encompasses all natural components that are normally stable or have predictable cyclical dynamics, and are located above and below this surface. These components include the soil, atmosphere and climate, surface patterns, the original soil material, water, fauna, vegetation, the results of present and past human activities, as they have significant impacts on the current and future use of land by humans ” (Brabant, 1991). Soil is the “ product of the alteration, reshaping and organization of the top layers of the Earth’s crust under the effects of living organisms, the atmosphere, and energy exchanges that occur there ” (Lozet & Mathieu, 1990). 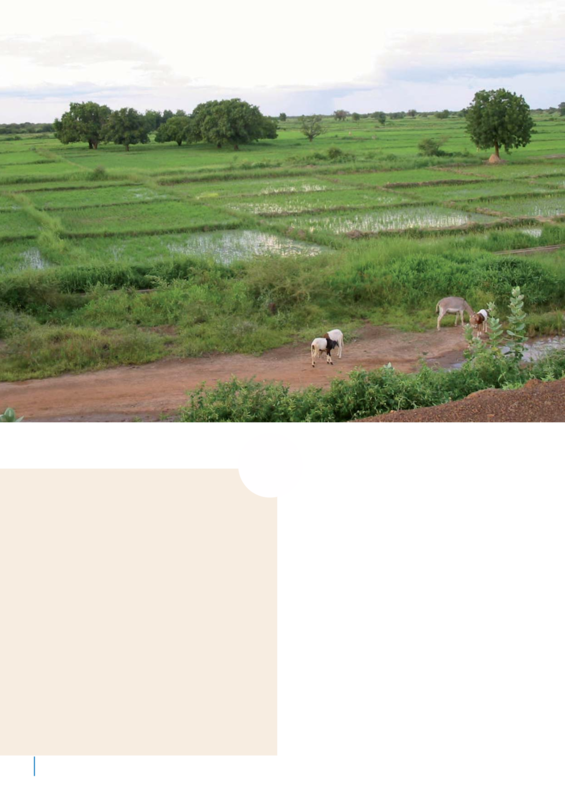 S Crop ﬁelds around Bogande, Gnagna province, Burkina Faso. Most States consider that their arable land resources a re nondepletable a nd t hat t hei r preser vat ion is not a pr ior it y. T hese nat iona l la nd resou rces a re, however, non renew able a nd t herefore prec iou s. Moreover, land is not considered important in t he eyes of the media. For instance, a special 162-page dossier published in December 2009 by the French daily newspaper Le Monde — entit led Bilan Planète (Ea r t h assessment) —included a CD-ROM ent it led Les enjeux du développement durable (susta inable development challenges) along w ith 50 maps. 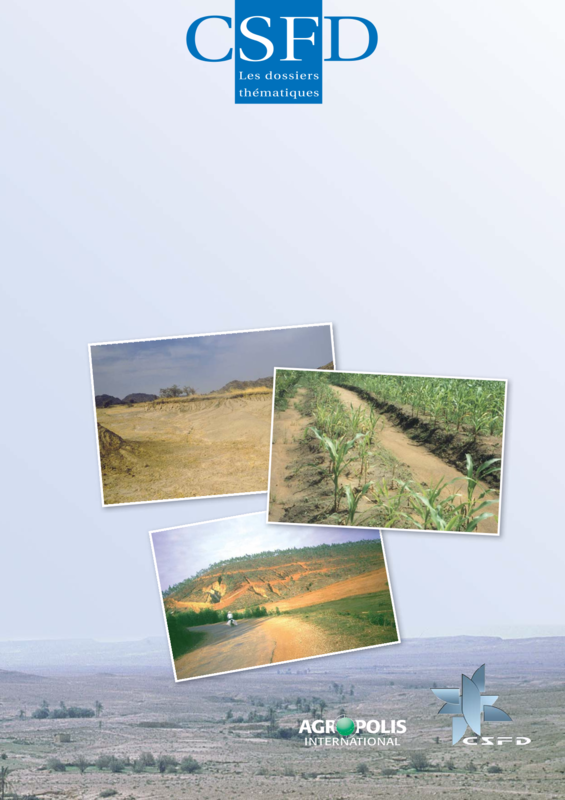 Only a ha l f page of t h is docu ment wa s devoted to t he status of soils in Africa. A few comments mentioned t he possibi lit y of long-ter m leasing of a rable la nd i n A f r ica a nd A sia by h ig h ly popu lated cou nt r ies w it h foresig ht, or pet roleu m-producing cou nt r ies w ith huge financial resources. Land resources and desertification were not mentioned on any of the 50 maps. Hence, there is a clear lack of interest in this vital natural resource for humankind. This shortcoming could partially be explained by land specialists’ lack of communication. S Togo, Dayes region. A thin soil (0.5 m) overlying hard and relatively unalterable bedrock (quartzite and schist). X Togo, Dayes region. This very thin soil (0.2 m) can completely erode away within less than 10 years if precautionary antierosion measures are not taken with respect to its exploitation. THE SEVEN MAIN FUNCTIONS OF SOIL Soil has seven essential functions. Six of these have a positive impact on agriculture and the environment, whereas the seventh function can sometimes have a negative impact.  Soil provides a substrate for plants and buildings. This is the main function of soil since it enables rooting of grass a nd tree species. The soil dept h required depends on the physiolog y of the plant. Other wise, many buildings are built on soil, not on bedrock. These buildings may collapse when there is a landslide or lateral sapping erosion.  Soil is a source of plant nutrients. Soil has a storage capacity for different elements, e.g. calcium, magnesium, potassium, sodium, nitrogen, phosphorus and trace elements. This capacit y varies w ith the quantit y of organic matter , and with the quantity and type of clay in the soil. The soil gradually releases these elements and they thus become available to plants, which absorb them through their roots.  Soil is a temperature regulator. Daily and annual air temperature variations are greatly diminished below t he soil surface, which is a particularly important feature in arid regions.  Soil is a water reservoir . It has a water storage and gradual replenishment capacity. It thus provides plants with a relatively steady water supply between rains or during a drought period. This storage capacity varies bet ween soil t y pes depending on the particle size, mineral composition and porosity.  Soil is a biological purifier. The soil macrofauna and m icrofauna act iv it y decomposes orga nic ma nure (plant waste, dung, straw and other crop residues), thus recycling the soil nutrients they contain. This activity can also to some extent transform and lead to the absorption of pollutant residues and pathogens.  Soil sequesters carbon. Soils on Eart h sequester a round 1 500 billion t of ca rbon. This is t hreefold more than the quantity stored in terrestrial biomass and twofold more than that in the atmosphere. This has a marked impact on greenhouses gases such as carbon diox ide (CO 2 ) and methane (CH 4 ), and thus on globa l warming (hy pothesis put for ward by the Intergovernmental Panel on Climate Change and a number of scientists).  Soil stores toxins from various sources—agricultural, industrial, etc.—which are taken up by clay, organic and hydroxide fractions. Heav y metals, dioxin, radioactive elements and other products can thus persist in soil for many years after being contaminated. This function can have negative impacts on agriculture and t he environment. The seven above-described functions are mainly related the agricultural usage of soil. Soil also fulfils other functions, such as:  S oil provides a source of construction material in areas where solid rocks are scarce. This includes laterite for road and airport runway construction, and clay which has been used for centuries for building houses and making pottery.  Soil is a burial place for most of the 85 billion humans who have lived since the origin of humankind.  It has prov ided a shelter for fighters during wars ever since weapons with a high destruction capacity have been used (Crimean War in 1855, and especially since 1914). “ Land is more important for soldiers than for anyone else ” (Remarque, 1956).  F inally, it is a conservatory of prehistoric and historic human activities—soil contains remains from all ages (charcoal, potter y, etc.) thus enabling the dating of these activities. EROSION, DEGRADATION, DESERTIFICATION— TERMS THAT SHOULD NOT BE CONFUSED L a nd de g r a d at ion h a s d r a m at ic a l l y i nc r e a s e d worldwide over the last 60 years because of population growth and industrial development. It is essential to note, however, that desertification, erosion and land degradation are three distinct processes that should not be confused. Erosion and degradation—two different processes Erosion occurs when all or part of the soil is carried a variable distance off its original site via water, wind, gravity or even farming tools and human development projects. Erosion is an irreversible process when soil is carried down rivers towards the sea. Degradation stricto sensu (s.s.) occurs when the land is degraded at the original site without soil movement or loss. 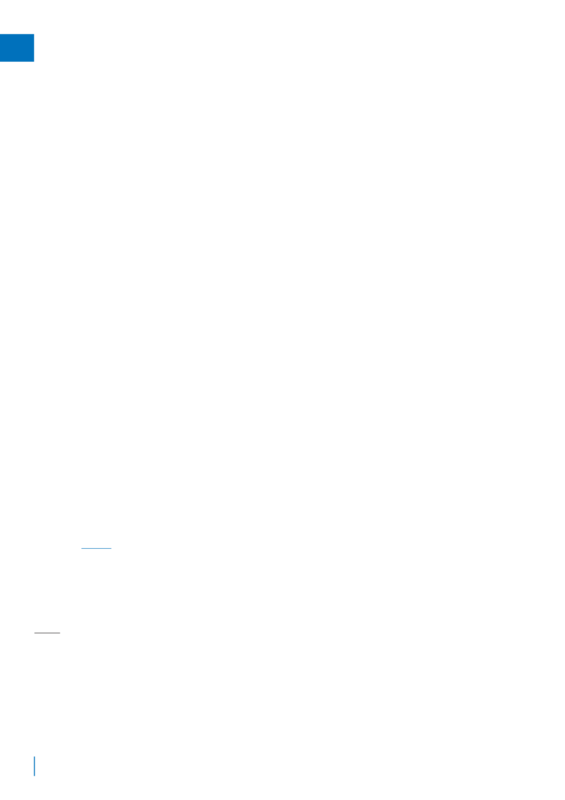 Degradation s.s. thus concerns the physical, chemica l a nd/or biolog ica l proper t ies of t he soi l. The processes involved are generally reversible, e.g. acidification of land. 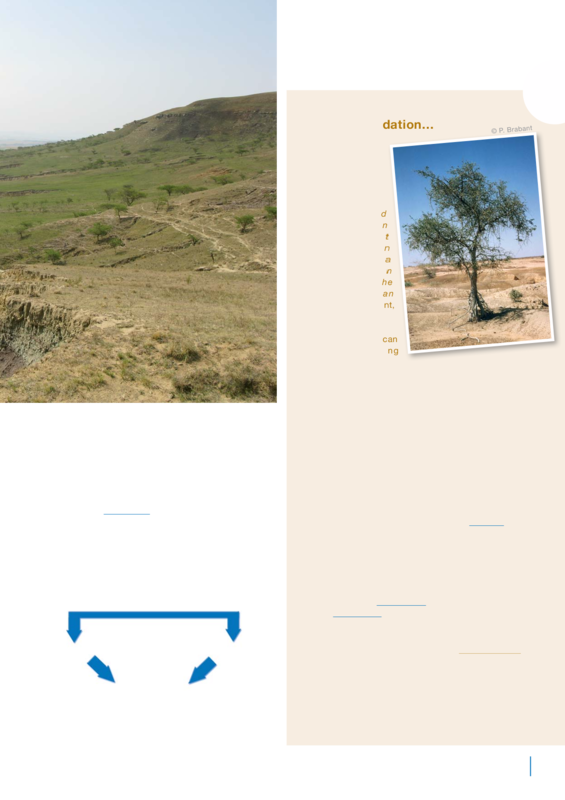 Desertification: a special case of erosion and degradation s.s. Desertification is a process involving erosion and/or degradation s.s. that occurs in environments under low rainfall conditions. According to Article 1 of the United Nations Convention to Combat Desertification (Paris, 1994), desertification means “land degradation in arid, semi-arid and dry sub-humid areas resulting from various factors, including climatic variations and human activities.” W i nd erosion i s t he ma i n t y pe of erosion, but desertification can also be the result of water erosion, physical and chemical soil degradation s.s. , such as salinization a nd aridification . Deser t if icat ion of ten corresponds to situat ions in which t he respect ive responsibilities of the climate and human activities are hard to determine. 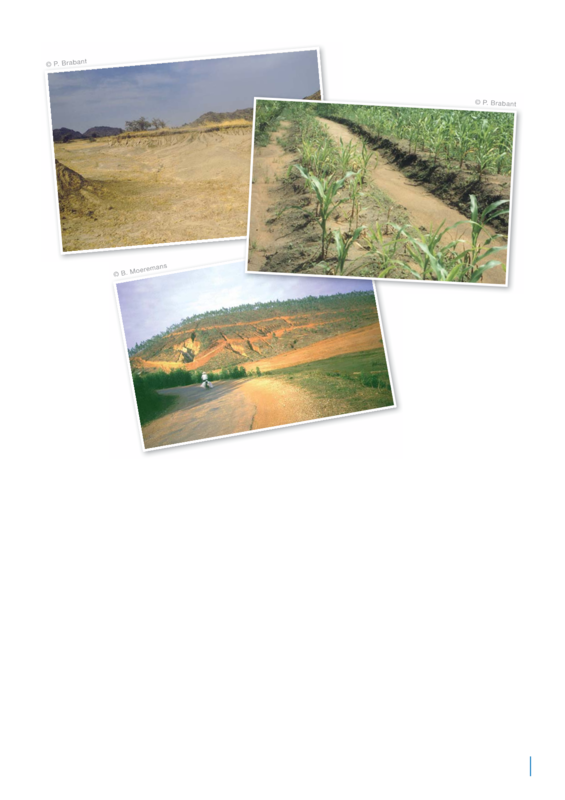 S Soil erosion in South Africa. Details of the erosion and degradation s.s. processes are not described in this document. 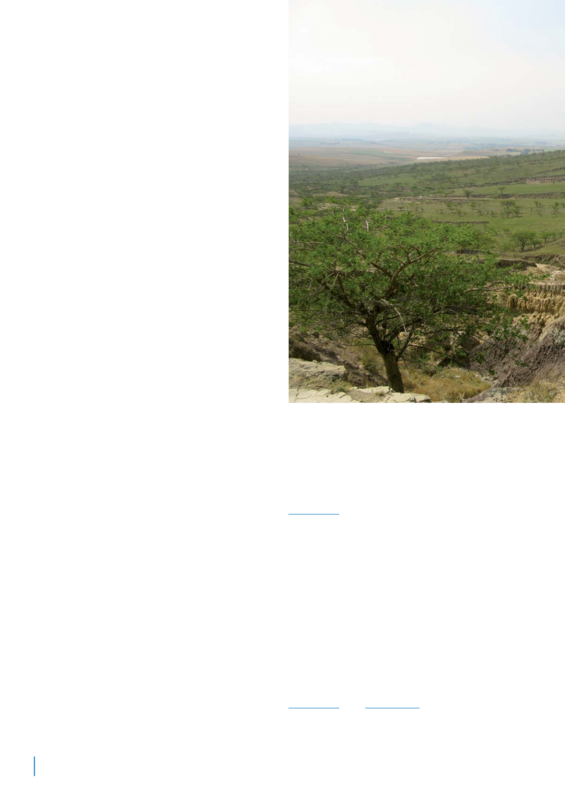 Interested readers may a lso refer to the many specia lised documents available when seeking more detailed information on these processes, land husbandry, and land degradation prevention and restoration (De Noni et al. , 2009; Roose, 1994). Land degradation “ i s a p r o c e s s th at d i m i ni s he s o r d e s tr oy s th e agricultural—crop or live stock—a n for e st prod uctio capacity of land. I is induced by huma activities or can be natural phenomeno a g g r avate d by t e f f e c t s o f h u m activities. ” ( Braba 2008). This degradation h a v e t h e f o l l o w i impacts:  relatively marked deterioration of one or several of the seven main soil functions;  disappearance of soil;  transformation of soil for a nonagricultural use;  soil pollution, making the affected areas unexploitable, or they may still be exploited but with major constraints for agricultural usage. Degradation first af fects the soil—the main land constituent. When soil degradation reaches a certain degree of severity, other land constituents are then also gradually affected, i.e. the type and density of the natural vegetation, nutrient reserves, soil fauna, crop yields, the type of exploitation and land use . The topsoil reflectance could also be added to this list. 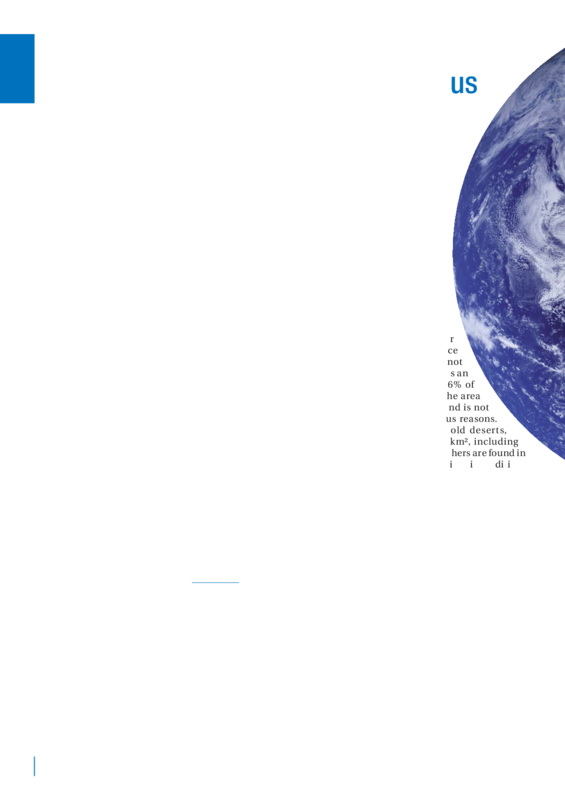 This parameter is used in satellite image interpretation to identify and monitor land degradation patterns on Earth. Soil reflectance is quickly modified when the soil becomes eroded or degraded. Erosion, along with different types of physical degradation (e.g. crusting, compaction and aridification ) or chemical degradation (e.g. salinization ), can thus be detected on satellite images, whereas they are generally less easy to detect visually in the field. S Burkina Faso. Highly degraded land. Only a few thorny shrubs are present.